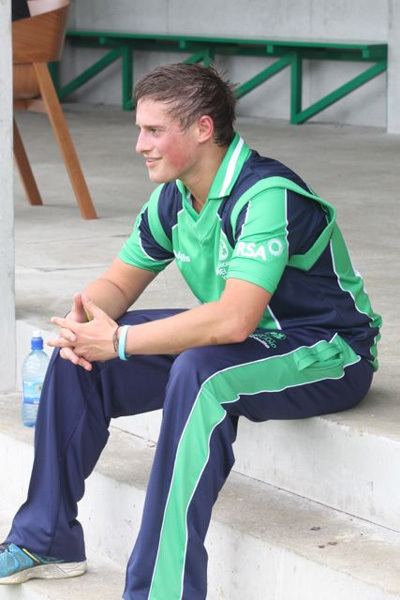 The Ireland Wolves squad finished today’s second four-day match against Sri Lanka A pleased with the team’s improved performance, but Sri Lankan batters dominated the day and ensured the home side avoided defeat. Resuming overnight on 180-4, Sri Lanka A’s batters – led by a double-century from opener Pathum Nissanka and a maiden first-class century from Chamika Karunaratne – put on 288 runs in just over two sessions to put the game out of reach for the visiting side. For the bowling side, 18-year old leg-spinner JJ Garth, in only his second first-class appearance, claimed 3-140 and seamer Mark Adair took 2-65, but they couldn’t deliver that knock-out blow on the tail that they achieved in the first innings. To inject some late interest in the game, the home captain Ashan Priyanjan declared with just over 30 overs still to play in the day, setting the Wolves a challenging target of 264 for an unlikely victory. Despite losing three early wickets, opener James McCollum (45*) (pictured) and Lorcan Tucker (22*) saw out the day and the team captains agreed to call an end to the match with half-an-hour of play left. After play, Wolves captain Harry Tector and Craig Young spoke about the game. This completes the red-ball matches of the current tour, and the Ireland Wolves and Sri Lanka A now turn to a five-match series of 50-over matches, starting on Saturday. Shane Getkate and Stuart Thompson join the Wolves squad for this part of the tour, while Gareth Delany – originally named for the white-ball squad – had joined the squad early as cover for Jack Tector who had to return to Dublin after sustaining an injury.